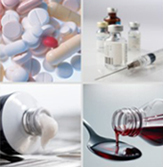 State of the art - GMP compatible manufacturing facilities for catering manufacturing needs of formulations in various dosage forms like: Tablets, Dispersible Tablets, Capsules, Sustained Released Pellets, Syrups, Suspensions, External Liquids, Dry Syrups, Ointments, Injections, Drops, Protein Powders, Granules and Medicated Soaps. Manufacturing staff of highly dedicated, well-qualified and experienced chemists to produce the best quality products. Documentation in all aspects of raw material analysis, in process quality control, finished good quality control is fully monitored to ensure medicaments of highest quality and purity.